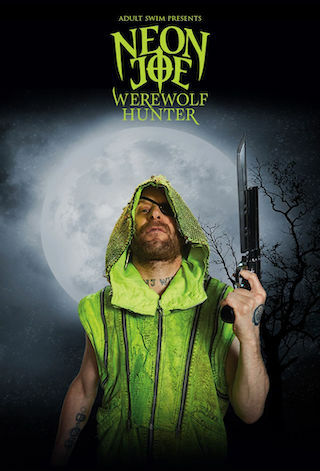 Neon Joe, Werewolf Hunter is an American 30 minute scripted science-fiction television series, which kicked off on December 7, 2015, on Adult Swim and is broadcast every Monday at 00:00. The show is currently in its 2nd season. Adult Swim is yet to announce the renewal of Neon Joe, Werewolf Hunter for Season 3 as well as its cancelation. Sign up to track down the show's status and its release date. Set in the pretend sleepy enclave of Garrity, Vermont (aka "B&B Town, USA! "), Neon Joe, Werewolf Hunter is the story of a neon-clad man with a mysterious past and a highly specialized skill set - hunting werewolves. When a sudden plague of inexplicable werewolf fatalities strikes, the Garrity sheriff's department finds itself in over its head and the fate of the townspeople is left up to Neon Joe. Will he catch the beast before the next full moon, or will it live another day and kill again?